Our shave butter is moisturizing and skin softening. Lightly scented with pure essential oils of lavender, sweet orange and tea tree. Packaged in a 4 oz jar. Directions: Smooth over warm moistened skin, shave as you normally would and rinse. 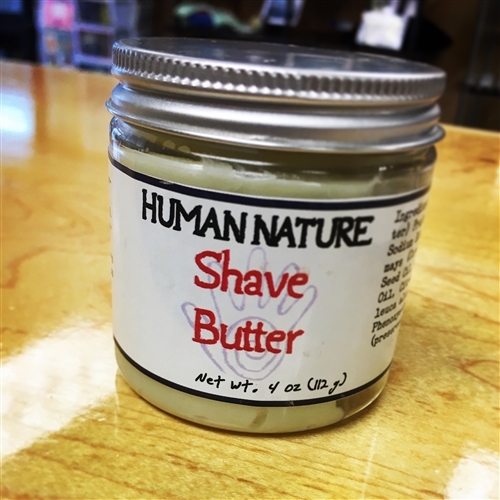 Ingredients: Shea Butter, Coconut Oil, Kaolinite (White Clay), Arrowroot Powder, Grapeseed Oil, Lavender Oil, Sweet Orange Oil, Tea Tree Oil, Tocopherol, Phenoxyethanol (and) Caprylyl Glycol (preservative).